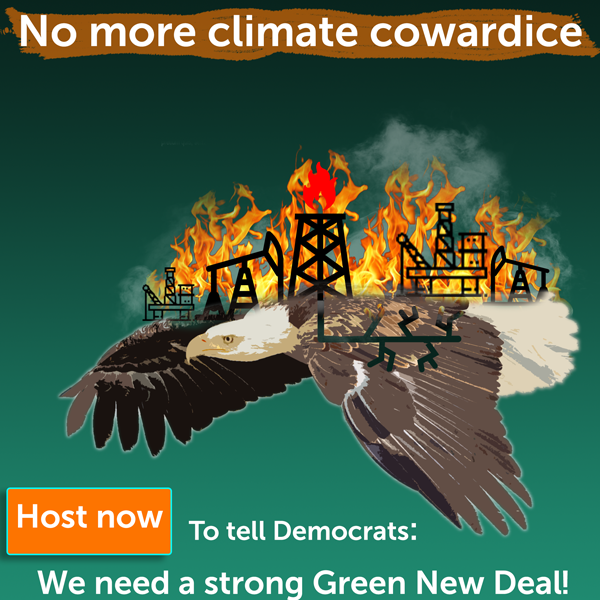 Host a Green New Deal Action! Donald Trump has finally given in and ended the longest government shutdown in history. But his attacks on our climate and common home keep coming. If there’s one thing we can learn from the shutdown, it’s that when we stick together and stand by our principles we can win. And that’s why I’m so excited to fight with you for a Green New Deal. Progressive champs like Reps. Alexandria Ocasio-Cortez have given us a unique chance: Her Green New Deal vision is a bold climate solution that would put power in the hands of communities, not corporations, provide family-sustaining jobs, and end our reliance on fossil fuels. The idea of a Green New Deal is gaining momentum in Congress. But too many Democrats claim to support the “idea” of a Green New Deal, while continuing to support fracking, fossil fuel subsidies and our dirty, climate-wrecking status quo. Which is why from February 4-8th, we’re joining a broad coalition of environmental organizations and people like you to visit our members of Congress and tell the we need REAL climate leadership. Will you join us? Demand that your Representative fight for Real Climate Leadership and a Green New Deal: Sign up to organize an event in your community next week! This is the moment to show the strength of our movement for climate justice: presidential hopefuls are starting to voice support for a Green New Deal, and new Congressional leaders are defining their priorities for the year ahead. If we are willing to push hard for the bold climate action we need, we can create real change. Halt all new fossil fuel extraction, infrastructure, and subsidies; And transition power generation to 100% renewable energy by 2035 or sooner. Dozens of organizations and hundreds of volunteers are already hard at work organizing events at local Congressional offices demanding a robust and powerful Green New Deal. Just check out the map of actions so far! Once you sign up to host, we’ll send you information and materials like signs, copies of petition signatures, and a toolkit from partners to help you plan your event. You just need to pick a time and place (your local Member of Congress’ office) and recruit some friends to join you there! Sign up to organize in your community for the Green New Deal Week of Action! We’ll support you as you plan your event and we’ll be on hand to answer any questions you have.